Anthony De Mello SJ and the order of St Ignatius - a personal gratitude and remembrance. A casual look at the 16th century portrait of Saint Ignatius of Loyola by the great sensualist, Flemish painter, master of color and depth - Peter Paul Ruben - will reveal a Man with regal bearing, an aristocratic face, steady gaze, slightly tilted upward in a divine trance, draped in crimson tunic, one hand holding a prayer book (possibly) and the other turned outward in benediction and renounced abandon; gently leaning against a table with effortless ease. One would scarcely believe that this is a picture of a man who founded one of the most influential, prolific, authentic and mystical Christian societies in the history of organized Christian church. “The society of Jesus” or the Jesuits, as it is known throughout the globe was established by Ignatius, the chivalrous soldier, in 1521, after his forced convalescence due to injuries sustained in a war against the French. The hot spirited warrior found his balm in the life of Jesus, and in the intense solitude of his recuperative confinement underwent a profound spiritual conversion that altered the way he perceived his life’s mission on earth. It was an odd age in western history - The 14th and 15th centuries; it was an age of pervasive superstition in the west and Catholic Church held sway over the minds and hearts of millions; ravaged by fratricidal wars, primitive belief’s and more importantly, rent apart by the virulent pestilence of Plague (Black death) that swept through most of Europe wiping away nearly half or more of its population- leaving in its wake a benumbed, morally, intellectually and physically weak generation of Men and Women - to whom Papacy and his priests were offering heavenly recompense at a price, to fill up its empty coffers , which would in turn help the Church to continue their persecution of infidels, non-believers and Jews. It was indeed “the darkest age of Christianity, and more so of Western civilization, before the knock of reformation stirred life back into its sinews. It was in this dark milieu that Ignatius established the order of Jesuits. Though he realized that Christianity as preached and practiced by the church was blasphemous, and against the very grain of Christ’s teachings, he was practical enough to understand that to set up an order in defiance of their authority would prove not only disastrous, but detrimental to what he had in mind. He carefully chartered the principles of his association, restraining its outward manifestations to within the boundaries of official Christian theology, but internally encouraging a broader, deeper enquiry into the mystery of the Trinity and its true mystical experience. He strongly believed that his friars must be in tune with his world outside, absorb all rays of knowledge that radiate toward them, seek a comprehensive unity of the material and spiritual world – all of this - without forsaking one's inner anchor in the sublime divinity of Christ. Ignatius wrote a series of exercises (Called “Spiritual exercises”) that a novitiate should undertake for a period of 28-30 days, focusing not on the historical episodes of Christ, his death and resurrection; but to turn the thinking mind inward to contemplate the symbolic references these events indicated. From 1524 onwards, this 200 page booklet of spiritual and mental practices have been the backbone of Jesuits all over the globe. Young aspirants, awakened by the call of divinity, joined this congregation to experiment with inward life. 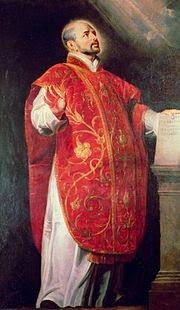 Though, in principle, they were expected to profess steadfast, rigorous obedience to the Pope as their final ecclesiastical authority, the surreptiously blooming freedom that was offered within Jesuit communities liberated their minds to seek meaning to deeper issues in a spirit of impartial study. Ignatius, being a man of the world, made sure that his book, his society and its adherents got the blessings of Pope Paul III in 1540, which meant that its members could now move around without fear of persecution or condemnation. Over the last four hundred years, young Jesuit priests have used this freedom to perform invaluable service in remote parts of the globe, establishing communities, spreading the word of peace and providing moral, religious instructions to those whom mainstream religions have neglected. Also, they have produced a multitude of scientists, doctors, sociologist, authors – who, trained in Jesuit missions have found their vocations in different walk of life, always carrying the fire of inner zeal and commitment to reconcile an intensely religious life with secular world. The reason for me to set this context of Jesuit’s in perspective was to talk about a Jesuit Priest whose works have had a profound influence on me early in my life. Nearly two decades ago, in one of the newly formed libraries in Chennai, I chanced upon a short book titled “The song of the bird”. It contained a series of short anecdotes, stories with succinct commentary by a priest named Anthony de Mello. It was a fascinating book. There was nothing religious about it and I remember being surprised that it was written by a Christian. Many years later, when my life had gone through it roller coaster rides, I again happened to read many of his other books including: “Sadhana: a way to God” and “Awareness”. 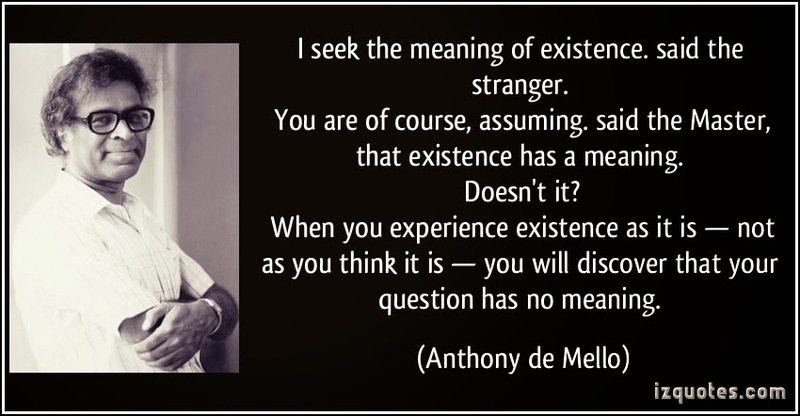 The fact that de Mello could think and write so eloquently about life without the underpinnings of dogmatic opinions, and also the fact that he was trained to be a Jesuit priest in the same tradition as thousands of others before him; only strengthened my faith in religion as an individual’s deep dive into oneself, and not as mechanical card bearing members of an organized religious sect. in 1972 De Mello founded a pastoral retreat In Poona, where members of different congregations assemble even today for month long stay of Introspection and study. A wonderful orator, passionate preacher, he was invited to various forums across the world, speaking to understanding audiences, who could easily relate to the kind of religion he was talking about. De mello constantly emphasized that peace and happiness were always available at hand; but one is reluctant to embrace it. He used to say “Majority of Mankind only want psychological relief, never a permanent cure...” De Mello was well prepared for death when it happened all of sudden in 1987 on his maiden trip to New York. He was fifty five years of age. But this time, I had tears in my eyes. It had taken me so long, after so much of battering and bruises to experience the deep meaning of De mello’ s innocuous sounding words, but it’s been worth the wait…. The regrettable face of ignorance. 87th Academy Awards - a musing..
Schrodinger's cat.... A quantum puzzle.